Residential property owners in majority-Hispanic and majority-African American census tracts pay more than their fair share of Cook County Property taxes. The average effective tax rate for homeowners in poorer neighborhoods like North Lawndale and Little Village has been about twice as high as in wealthier neighborhoods like Gold Coast and Lincoln Park. Under Cook County Assessor Joseph Berrios's assessment system, residential properties in majority-White census tracts are chronically under-valued compared to their market value; while residential properties in majority-Hispanic and majority African-American census tracts are chronically over-valued compared to their market value. 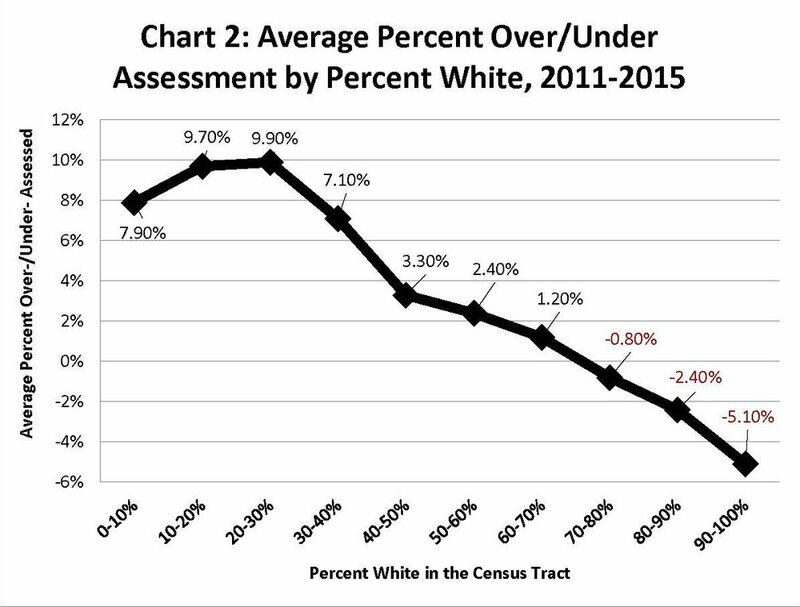 In fact, the data shows that as the percentage of non-White residents in a census tract increases, so does the assessment ratio, resulting in properties generally becoming over-assessed [see chart above]. Residential properties in majority-Hispanic and majority-African American census tracts are twice as likely to be over-assessed by 20% or more compared to residential properties in majority-White census tracts. In Brighton Park, 46% of residential properties that sold between 2011 and 2015 were over-assessed by at least 20%, and 7% of residential properties were assessed at more than double their market value. Hermosa is the third most over-assessed neighborhood in the city. Data from homes sold between 2011-2015 shows that the Hermosa neighborhood properties were, on average, 24.4% over-assessed and that even following individual homeowner appeals, the neighborhood was still, on average, over-assessed by 23.5%. In contrast, properties in the predominantly-White Lakeview neighborhood were 11.3% under-assessed and then further under-assessed on average by 14.9% following appeals. The Cook County Assessor’s office performs flawed assessments of property values using a jumble of secret formulas that his office refuses to disclose. Although property owners can appeal their assessments, the expensive appeals process actually makes Berrios’s assessments more regressive. Berrios has been aware for years that his office’s residential valuations are inaccurate and regressive, and in 2015 he publicly claimed to fix them using a new statistical valuation system developed by the MacArthur Foundation. Yet the office continues to use the current discriminatory methods to conduct property assessments. What will a lawsuit achieve? The complaint asks the Court to declare Berrios’s valuation methods invalid and to order his office to adopt and implement a fairer, more accurate, transparent, lawful, and nondiscriminatory assessment system. It also seeks the appointment of an independent monitor to oversee adoption and implementation of a new system and ensure court oversight of the process.